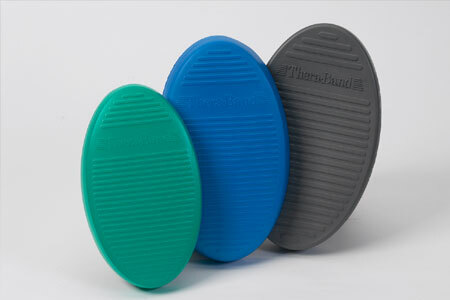 TheraBand® Stability Trainers are oval-shaped, color-coded pads, supplied in three densities to provide a progressive system of balance training. The green (firm) and blue (soft) TheraBand Stability Trainers are closed cell foam pads with an anti-slip ridged surface and oval foot fitting shape. The foam pads are effective for balance training in older adults, rehabilitation of lower extremities, and for sports performance enhancement. Filled with air, the black (extra soft) TheraBand Stability Trainer provides advanced challenge compared to the green and blue Stability Trainers. Made of durable PVC, the extra soft Stability Trainer's heavy gauge side walls resist the tendency to roll the ankle during exercise.